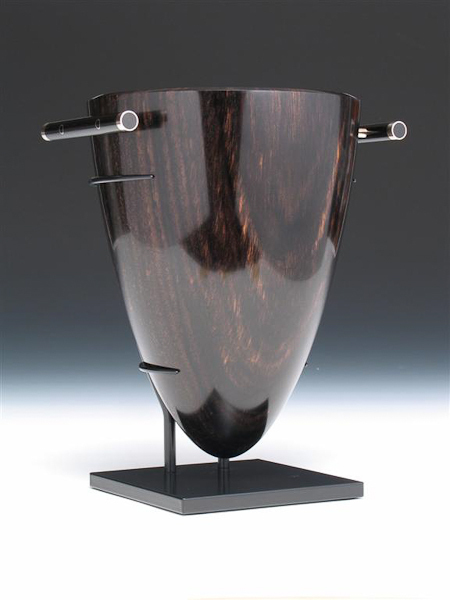 View #2 - Ebony with white Gold. Steel stand. 8.25" tall x 6.75" wide. I first turned the vessel in 1999. I had almost forgotten about it until a visiting collector noticed it sitting on a shelf coverd with dust.She requested that I fnish the piece for her. Completed Summer of 2011. This is the largest piece of flawless Gabon ebony I have ever seen. It now resides in a private colllection on the Phillipines.